Cape Air, one of the nation’s largest regional airlines based in Hyannis, Massachusetts, has completed Factory acceptance on their Frasca built. Cessna 402C Level 6 Flight Training Device (FTD). 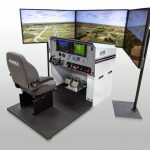 The FTD includes an actual Cessna 402 cockpit shell, Frasca’s TruVision™ with 220° x 60° visual display system and many other features. The simulator is ready for delivery and will begin training service in January 2015. Cape Air has made a significant commitment to enhancing their already robust training programs with this FTD. 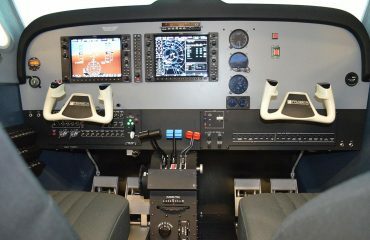 A Cessna 402C cockpit section was provided by Cape Air for ultimate realism and is an actual, type-specific flight deck of the 402C. Level 6 is the highest level of qualified FTD and presents the greatest transfer of training possible. One aspect of Level 6 is the FTD is objectively tested and compared to actual aircraft data gathered during a flight test. The parameters and tolerances of the device must be within very close tolerances of the aircraft data which assures the verifiable proof of match between the Frasca FTD and the aircraft. The Cessna 402C aircraft was flown to gather the data used to design and develop the aeronautical and systems models that are going to be evaluated by the FAA National Simulator Program to qualify the device. Even high alpha and stall profiles (some as low as 49 KIAS) were flown to gather data that is typically not required to be collected. However, Cape Air and Frasca felt this would provide the best training outcomes as this type of aircraft is generally not stalled during in-aircraft training. The opportunity to do this was exceptional. 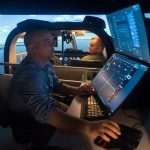 The FAA and RAeS have been pushing simulation to gather data on the very edges of the envelope due to recent high-profile accidents involving stalls and loss-of-control (LOC). The data gathered allows the simulation to use real aircraft data throughout the regime from incipient all the way to full stall. Frasca devices can even include a feature to help train for upset recovery. Another unique element of the Frasca device is the ability to remotely trigger the nose-baggage door to pop open. 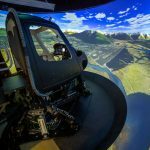 Since the real aircraft cockpit was used, Frasca was able to utilize this to recreate real world training scenarios effectively. This allows pilots to train for conditions that are impossible to train for in the aircraft, further enhancing the safety and training Cape Air pilots receive. 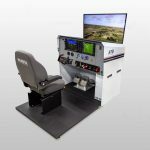 “Partnering with a worldwide leader such as Frasca on the development of the Cessna 402C Level 6 Flight Simulation Training Device, has allowed Cape Air to remain at the forefront of creating an unparalleled learning environment for our pilots in training. We are devoted to continuously enhancing the employee experience, and know that the addition of the FSTD will greatly augment our training programs,” said Linda Markham, President of Cape Air. Now in its 25th year, Cape Air is one of the largest independent regional airlines in the United States annually flying over 735,000 passengers to destinations around the world including New England, New York, the Caribbean, the Midwest and Micronesia. With a fleet of seventy-five Cessna 402s, four Britten-Norman Islanders, and two ATR-42s, the employee-owned company operates up to 550 flights per day. Based in Hyannis, Massachusetts, Cape Air also operates flights under the Nantucket Airlines brand. Cape Air is a codeshare partner with United Airlines and American Airlines in the Midwest. In Micronesia Cape Air operates as United Express. In addition, Cape Air has ticket and baggage agreements with most major airlines. Cape Air’s unique brand of customer service, MOCHA HAGoTDI,* has earned the airline accolades as ‘Best Airline’ on Nantucket, Martha’s Vineyard and in the United States Virgin Islands. The airline has been recognized for outstanding philanthropy in the communities it serves and Cape Air Founder and CEO Dan Wolf was recipient of the Ernst & Young Entrepreneur of the Year™ Award.